Kansas City, MO June 28, 2017–A massive pair of monumental bronze doors considered to be the defining moment of the Italian Renaissance is a promised gift to The Nelson-Atkins Museum of Art in Kansas City, an acquisition made possible by museum Trustee Paul DeBruce and his wife, Linda Woodsmall-DeBruce. 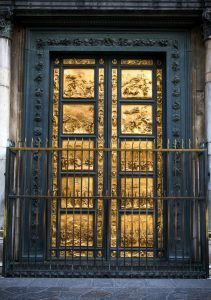 The 17-foot-tall gilded doors, weighing 4 1/2 tons, are casts of the original doors created in the 15th-century workshop of sculptor Lorenzo Ghiberti for the east facade of the Baptistery of the Duomo (cathedral) in Florence, Italy. Ghiberti’s original doors can be found inside the Museo dell’Opera del Duomo di Santa Maria del Fiore. 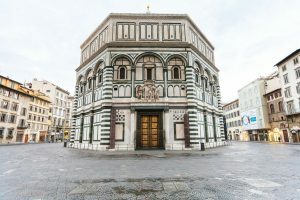 Casts of those doors were made in 1990, and a set was installed on the outside of the Baptistery in Florence (pictured to the right). The doors to be installed at the Nelson-Atkins are a sister set to those at the Baptistery. The installation in the Nelson-Atkins will be the first time the casts will be seen in a U.S. museum. Paul and Linda DeBruce were in Florence several years ago with plans for a sight-seeing trip outside the city. However, because of a change in weather, they decided to visit galleries instead. “It was a rainy morning in Florence when Linda and I stepped into the Frilli Gallery,” DeBruce said. “We soon became involved in conversation with Clara Marinelli, who encouraged us to visit the Marinelli Foundry. Later we did make that side trip, and I’m grateful that we did. We were so moved by what we saw, and we were intrigued by the layers of history and craftsmanship linked to the restoration and casts of the Baptistery doors. Eventually we discovered that sister casts of the Gates of Paradise were in storage in India and were owned by a Japanese patron who had paid for restoration of the original doors and for casts to be made in 1990. Julián Zugazagoitia, Menefee D. and Mary Louise Blackwell CEO & Director of the Nelson-Atkins, said an installation crew at the museum would begin work in mid-July to prepare for installation of the doors. In Florence, the Baptistery is renowned for its three sets of spectacular bronze doors lavishly decorated with relief sculptures. The south doors were created by Andrea Pisano in the 14th century. In 1401, Ghiberti won a competition to design doors for the north side, and he spent 21 years (1401-1422) creating a pair of gilded bronze doors that depict scenes from Jesus’s life. The doors were close in style to the earlier Pisano gates, with their square medieval quatrefoil design. In 1425 Ghiberti, by then widely recognized as the most accomplished sculptor in Florence, received a second commission to design the east doors of the Baptistery, on which he and his workshop toiled for 27 years (1425-1452). The massive bronze doors consisted of 10 richly decorated, sculptural panels depicting scenes from the Old Testament, including God’s creation of Adam and Eve, Abraham’s near-sacrifice of Isaac, and Moses on the mountain, receiving God’s commandments. The panels are surrounded by intricate, gilt framework of foliage and fruit and contain many statuettes of prophets and 24 busts. The two central busts are portraits of the artist and his son, Vittorio Ghiberti. Because of the doors’ striking beauty and grandeur, Michelangelo himself said they were “truly worthy to be the Gates of Paradise.” The area between the Baptistery and the Duomo was referred to as “paradise” during the 14th and 15th centuries. The doors have for centuries been considered one of the masterpieces of Western art and the beginning of the Renaissance. The very definition of a Renaissance man, Ghiberti was a sculptor, painter, draftsman, architectural consultant, stained-glass designer, entrepreneur, author of a treatise on the arts, and the first artist to write an autobiography. He said, with characteristic bravado, that “few things of importance were made in our city that were not designed or devised by my hand,” a statement that has not been contradicted. The original gates, whose panels depict biblical stories, adorned the Baptistery for nearly 500 years until there was an urgent need to protect them from the bombing of the Nazis during World War II. At that time Bruno Bearzi, owner of one of the most prominent artistic foundries in Italy, was appointed to remove and protect many important and emblematic monuments of Florence. These monuments were hidden in secret places scattered throughout the city; the massive, gilded Gates of Paradise were hidden inside a railway tunnel just outside Florence. In 1954, when the danger had passed, Bearzi was asked to bring the monuments back. He studied each work carefully and made gypsum molds that were archived for future use. Bearzi’s task was to repair the hinges of the bronze doors, but he spontaneously decided to restore Gates of Paradise, the most famous of the three pairs of bronze doors. He then took it upon himself to cast the entire Gates of Paradise, as well as another edition. That edition was eventually installed at Grace Cathedral, an Episcopal cathedral in San Francisco, California. From the same molds, Bearzi reproduced yet another edition that was installed in 1971 at the Lutheran Trinity Church of Hicksville in upstate New York. Bearzi then sold the gypsum molds to Aldo Marinelli, a colleague associated with the famed Frilli Gallery, founded in Florence in 1860 by Antonio Frilli, whose gallery achieved international fame for casting marble replicas of sculpture. The Marinelli Foundry in Florence produces works in bronze using the lost-wax technique, and casts are installed throughout the world. In the 1960s, the Marinelli Foundry provided several sculptures for the Country Club Plaza, including the beloved Wild Boar of Florence by Baroque artist Pietro Tacca. As the boar’s shiny nose can attest, it is considered good luck to rub the nose or to slip coins into the slot on the base. Also seen on the Country Club Plaza, the foundry created casts of Pomona by Donatello Gabrielli and The Allen Memoral Foundation of a Kneeling Woman, by Gemignani, donated in memory of J.C. Nichols’ daughter and son-in-law, Eleanor and Earl Allen. In 1990, Marinelli proposed protecting the original Baptistery doors by replacing them with a new cast with financing from one of his most important clients, Japanese businessman Choichiro Motoyama. 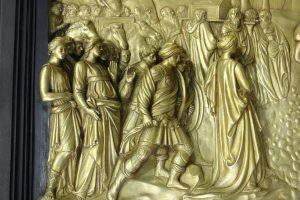 The intent was to permanently substitute the new casts for the original Ghiberti works of art. In exchange, Motoyama was allowed one sister cast from the original Bearzi molds to keep for himself. That cast stayed inside a warehouse in Florence for nearly 25 years, until an international exhibition was organized to promote Florence and the Renaissance. Between 2013 and 2016, the new casts of Gates of Paradise traveled in that exhibition, in a tour that included Mumbai, India and Seoul, South Korea. On returning to Florence, they were finally purchased by the DeBruces as a promised gift for the Nelson-Atkins. The massive gates were crated, sent on a ship across the ocean, and transported to Kansas City, arriving in February of this year. The casts of the Gates of Paradise will be installed in the Bloch Building in Summer 2017, just ahead of the 27th annual International Sculpture Conference, which will be held in Kansas City October 25-28. Page one: Casts of the original Gates of Paradise are now installed on the outside of the Baptistery in Florence. Photo provided by iStock. Page two: Detail of the doors to be installed at the Nelson-Atkins. This section depicts the story of Joshua ordering the Israelites to cross the Jordan River. Photo by Toni Wood. Page three: The Gates of Paradise grace the east doors of the Baptistery in Florence. Photo provided by Alamy Stock Photos.